In the internet era, when all the bad news in the world is only a few clicks away, even the most diligent activist starts to feel like the world’s troubles are distant figures, a quiet hum in the background of their daily life. Using her thought-provoking independent study, studio art major Carolyn Webster ’19 hopes to change that, bringing the great problems of the age and the great causes that can solve them into her audience’s field of vision. According to Webster, her focus is on “the deep-rooted struggle presented by settler colonialism and its ongoing and active effects that have gripped indigenous nations throughout the United States.” In her I.S., she defines settler colonialism as “the history in which settlers drove indigenous populations from the land in order to construct their own ethnic, religious and/or national communities.” These nations have suffered from the exploitation and harmful extraction of their resources, the seizing of their ancestral lands, the displacement of their people and the corruption and destruction of their culturally-vital environment through climate change. Indeed, the supposedly “impending” issue of climate change has already had profound effects on indigenous nations in the United States and around the globe. Webster’s I.S. seeks to bring the discrepancy between distant, futuristic understandings and the current reality into focus, showing how Western perceptions of climate change have erased the struggles of the marginalized people who live with the consequences of ever-expanding industry. Webster expresses this call to understanding through the medium of printmaking. She uses layered paper and ink to signify “a sensitivity to what could be — and what usually is — overlooked,” giving the viewer “a sense of this erasure — in one section you might see red, and the next, it’s covered completely. But it’s still there.” She also utilizes bases of found wooden planks and sticks to “create a conversation centered on climate change.” The piece pictured above, titled “marginal,” captures this sentiment perfectly; the crimson and charcoal of scorched earth and burning, blackened trees swoop in and out of the piece, disrupting their own place in time, silently disappearing and reappearing through the cream-colored paper background, lending the piece a sense of environment and land. A process called chine collé has been used to hand-press man-made inks forcefully into the paper, emphasizing the apocalyptic blackness of the charcoal. Webster’s I.S. 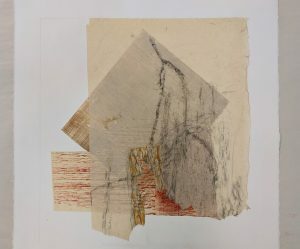 pieces will be on display in the MacKenzie Gallery in Ebert Art Center from March 24 to March 29, alongside the works of the equally talented studio art majors Reagan Kazyak ’19 and Ha Tang ’19. Selections from Webster’s I.S. will also be exhibited in the Sussel Gallery as part of the Senior Group Exhibition, beginning April 26 and ending May 5, alongside the work of 10 other studio art majors chosen for the exhibition. Both Webster and this writer encourage all students, regardless of level of experience with the arts, to attend both shows, support all the talented artists exhibited there and even get a chance to talk with artists like Webster about their work. MacKenzie Clark - who has written 85 posts on The Wooster Voice.